Shannon and I are so excited for the next round of the Young House Love and Bower Power Pinterest Challenge! I am not quite sure what I am doing/posting about yet, but I can't wait to see what Sherry, Katie, Emily, and Renee come up with. Who else is participating?? The link up is scheduled for Wednesday so you have all weekend to craft/cook/bake up something good! 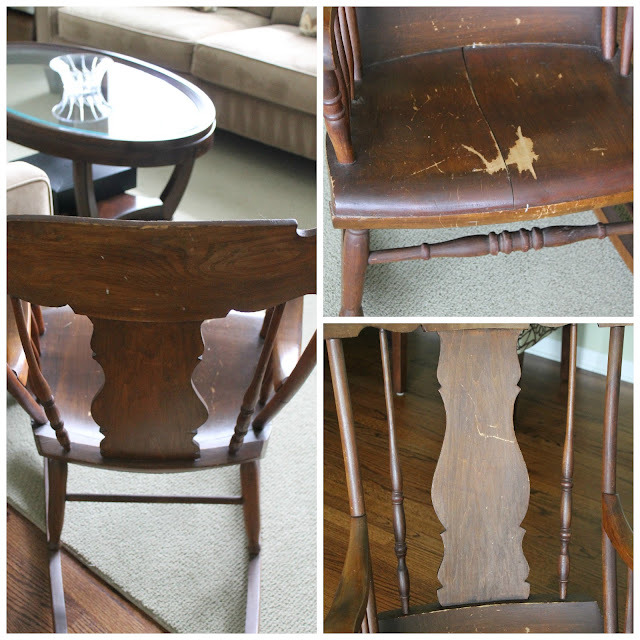 A little history on the chair - it was one of the first things I "collected" for my first apartment after college. It belonged to my parents' neighbors and they were getting ready to move. 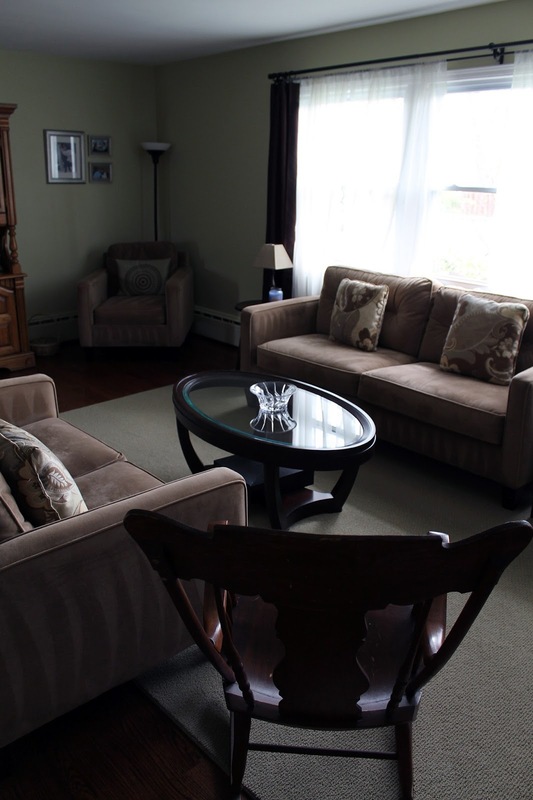 At this point in my life - a poor, newly professional recent college grad - I was taking anything anyone was getting rid of just so I could have something to sit on in my new apartment. Apparently, the neighbor was rocked to sleep as a baby in this chair by his mother many many years earlier. That made it even sweeter. I finally decided to bite the bullet and use some of the leftover cabinet kit to give this baby some new life. The first step is to degloss. Wearing gloves, I used the included scrubber pad and deglossing liquid and gave the whole thing a wipe down. It took a little longer than I was expecting because of all the nooks and crannies. Once it dried for a couple minutes, I took a damp cloth and wiped it down again. It then sat in the garage overnight until JJ's naptime the following day. Here it is after giving it a first coat of the bond (color coat). You just paint it on like regular paint. Again, it took longer than I anticipated because of all the surfaces. I thought it looked great until I looked at it in the shade and saw some of the streaky-ness. This past weekend, I gave it another thorough coat. I made sure to cover every inch (even under the rails and every little piece of the spindles). The coverage after the second coat was much better. The texture though was very flat and sort of rough feeling. It was almost chalk-like for lack of a better term. I was afraid it would still feel rough after the top coat, but thankfully it smoothed out. During JJ's Sunday nap, I completed the final step - the bond coat. This stuff was sort of milky and a weird consistency. I stirred it as much as I could while trying not to make any air bubbles (as the directions said) and I still didn't feel like it was mixed well. I carefully brushed it on trying to keep it even and catch all the drips. After leaving it out in the garage to dry for a couple days, I brought it into the house Tuesday night after work. Here he is, back in the living room (I apologize for the quality of the pics, it was dark out when I remembered to take them). Its definitely not perfect - all those scratches and cracks are still in there, but I like it that way. It still has some character and history to it. And I think the color goes so much better with the wine rack and accent chairs behind it. I am glad I was lazy all these years and didn't paint it white. The Verdict: I am pretty happy with how it came out. It took me a total of 4 naptimes (of about 1.5 hours each - give or take a half hour) to complete - 1 for deglossing, 2 for the bond coats, and 1 for the top coat. 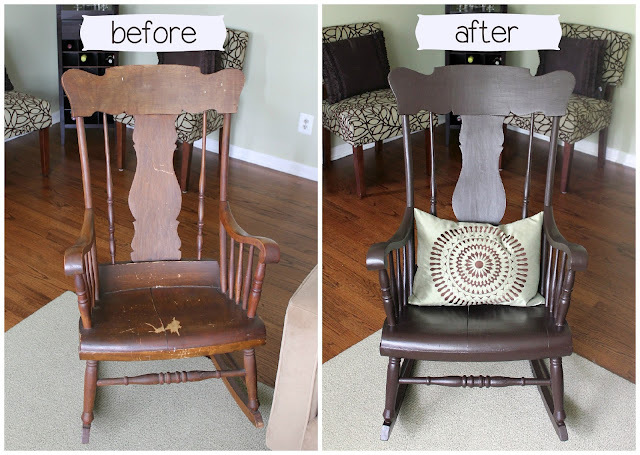 I thought it would be a little quicker, but I neglected to take into account how detailed this rocker is. Things to Consider: Like I said, its definitely not perfect. 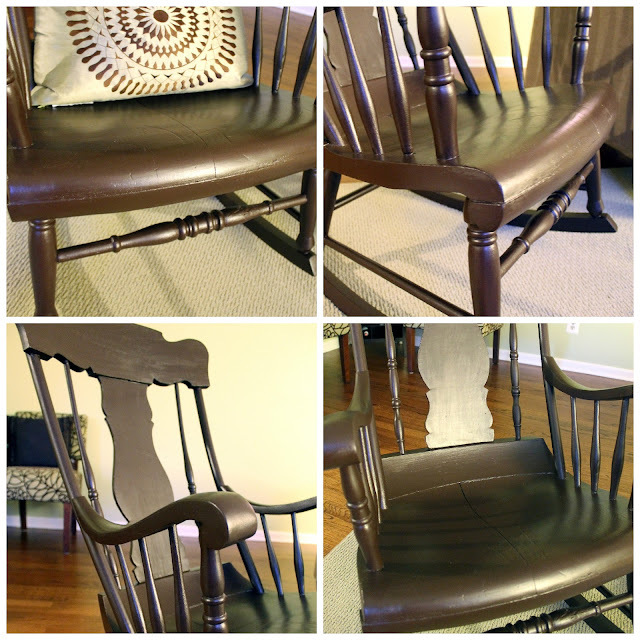 Aside from the flaws in the rocker itself, I agree with Joe that the finish is a little streaky. I also wound up with some bubbling/drips on some of the edges and near the bottom of the spindles. I think having a little foam brush to "soak up" some of the excess would have helped out with that. But like I said above, I think it looks 100x better and yet still worn and "lived in". Its in pretty good shape and I love having all the storage it provides, but the color is not really working (its more oak-y). The style really isn't my fav either, but I think it would be easier to live with if it wasn't yellow. Anyway, that is the summary of my experience with the Rustoleum Cabinet Transformations kit. Anyone else every use it? What did you think?